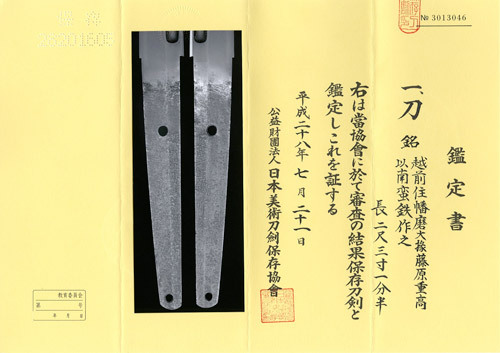 Blade construction: The nagasa measures 70cm and blade tapers a bit on stronger side, have a shallow Sori and ends in a medium Chu-kissaki referred to as Kanbun-shinto-sugata. Kasane is thick measures 7.3mm on base holding massive volume of Hiraniku and solidly heavy on hands. There are round-end Bo-hi grooves on both sides. Forging (Hada): Steel gives off darkish blue impression and Kitae is conspicuous Itame-hada. The entire skin of Hiraji shows sparkling martensite crystals of Ji-nie to generate black gleaming lines of Chikei activity. It is entirely and splendidly active with conspicuous Itame forging mark. Temper (Hamon): Hamon of visible hardening pattern has undulating Notare that consists of Gunome and clove outline of Choji. Hamon is rather on stronger side Nie based and boundary line is covered thickly with sparkling martensite crystals. The interior is filled with mist-like Nioi. Thick lines of Nie feet frequently activate toward the cutting edge and white clouds of YOU appears here and there. The entire hamon is rich in activity with sparkling Nie and misty Nioi. Temper of tip (Boshi): Hamon of Boshi becomes Niju-ha double boundary lines below Yokote then straight along Fukura, medium circle turns back. Tang (Nakago): UBU in original. Two mekugi-ana retaining holes. Katte-sagari shallow slanting left filemarks. Kurijiri double-bevelled heel. Back ridge is flat with Katte-sagari filemark. The signature on Hakiomote starts with the place of work Echizen-ju 越前住, an official title of Harima-daijo 播磨大掾, name of clan Fujiwara 藤原 and the name of smith SHIGETAKA 重高. The other side is inscribed as "Nanbantetsu" wo-motte kore-wo Tsukuru 以南蛮鉄作之 demonstrating proof of use of imported steel from Portgul/Spain. At the dawn of the Shinto Age in Echizen provice (now Fukui pref. ), Azuchi-Momoyama period the 1570s, Native sword smiths in Seki such as KANETANE 兼種, KANENORI 兼則 had moved to Echizen or MASANORI 正則 and were invited from capital Yamashiro. Furthermore AOI crest was bestowed on YASUTSUGU 康継 of Shitahara school from the Lord Tokugawa and 16 petals KIKU crests were bestowed from the Imperial Court on KUNIKIYO 国淸 of Kunihiro school. They strived with another in skill for performance or strength and beauty of martial spirit upon increasing demand from Samurai. The smith SHIGETAKA 重高 with the official title of Harima-daijo 播磨大掾, had come from IIda, Shinshu province then moved to Seki to become a disciple of KANENORI 兼則. SHIGETAKA 重高 had moved to Ichijōdani, Echizen to accept and invitation to work for Asakura clan along with his master KANENORI 兼則. 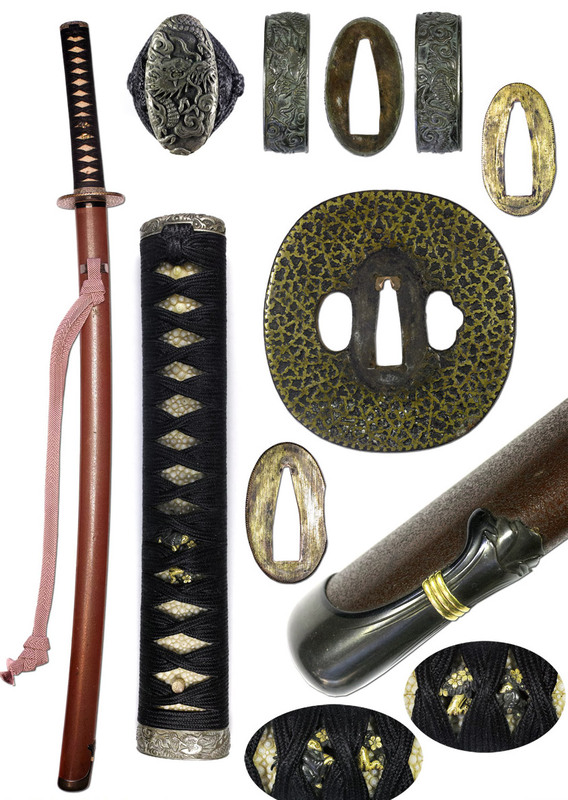 The subject Katana, using the highly valued "Nanbantetsu" an imported steel from Portugal or Spain, was made by 2nd generation SHIGETAKA 重高 who apprenticed himself both to his father also to smith KANETANE 兼種 to acquire epoch-making technique of Shinto-era to emerge from the medieval Koto period. Advance early Edo period, it was believed that forging fine steel "Tamahagane" from TATARA furnace adopted the imported steel resulted in durable construction and better cutting performance, enjoyed a high reputation as Wazamono Sharp performance. The subject katana is designed it's Nagasa at Jo-sun interpretations in a highly harmonious manner and wide on base with thick with massive volume - healthy heavyweight to show the typical shape during Kanbun - Enpo (1661-80) period, full of the Samurai martial spirit.